Plan & section of entrance, Burroughston. Oblique aerial view centred on the Hillock of Burroughston broch, looking E.
Sketch plan of Burroughston broch. 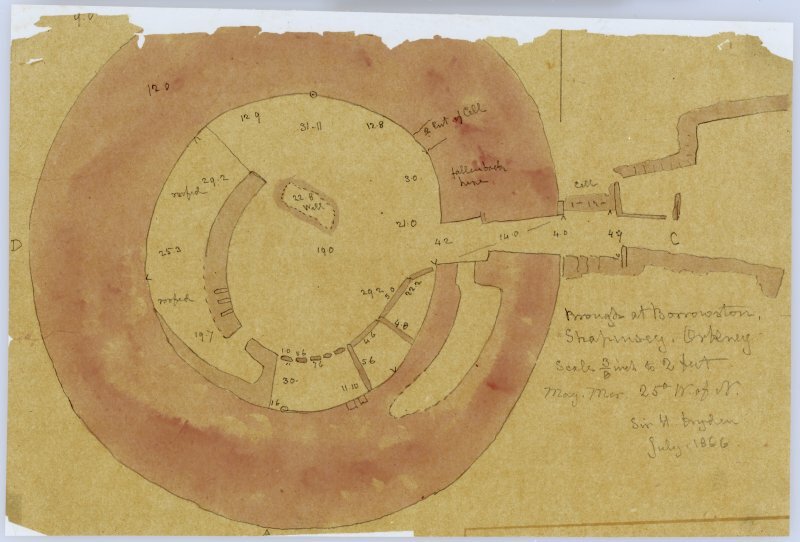 Drawing showing plan of Hillock of Burroughston broch, Shapinsay. Oblique aerial view centred on the Hillock of Burroughston broch, looking S.
Oblique aerial view centred on the farmstead at East House, Burroughston, looking N.
Oblique aerial view centred on the Hillock of Burroughston broch, looking W.
Drawing showing plan and section through Hillock of Burroughston broch, Shapinsay and fragment of a skull found at Broch of Lingro. Burroughston panoramic vew of interior. 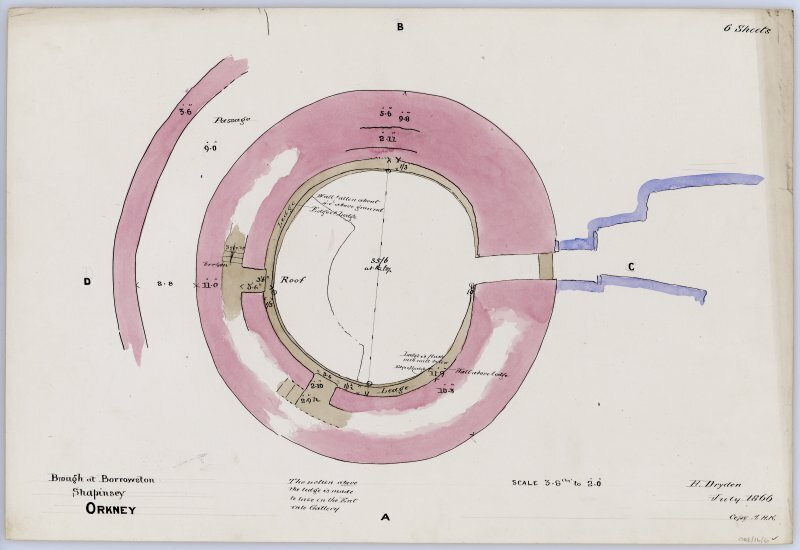 Plan and section of structures and earthworks. Signed H.Dryden, July 1866 copied by AHK. 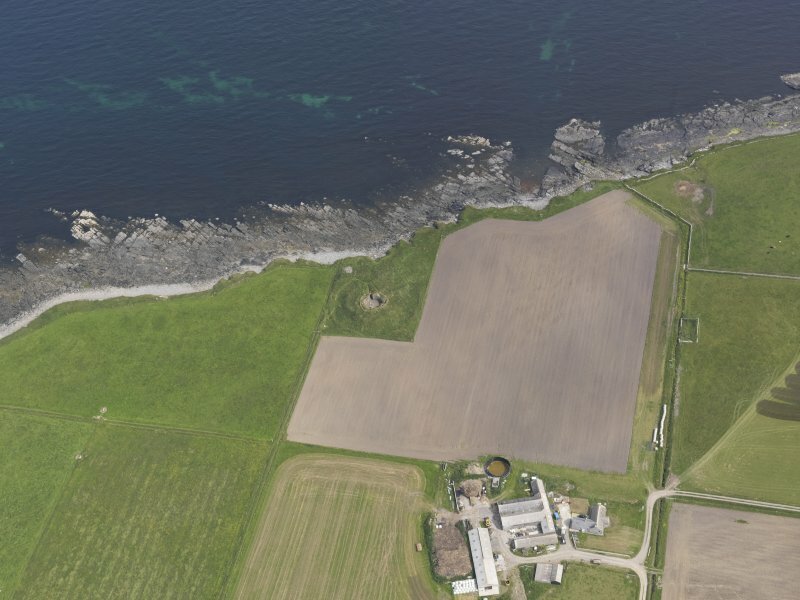 Situated on the NE coast of Shapinsay, the walls of the Iron Age broch at Burroughston still stand above first-floor level in places. Its entrance and adjacent 'guard' cell are similarly well preserved, while a wall, ditch and rampart, which probably once encircled the broch, are evident around the structure. 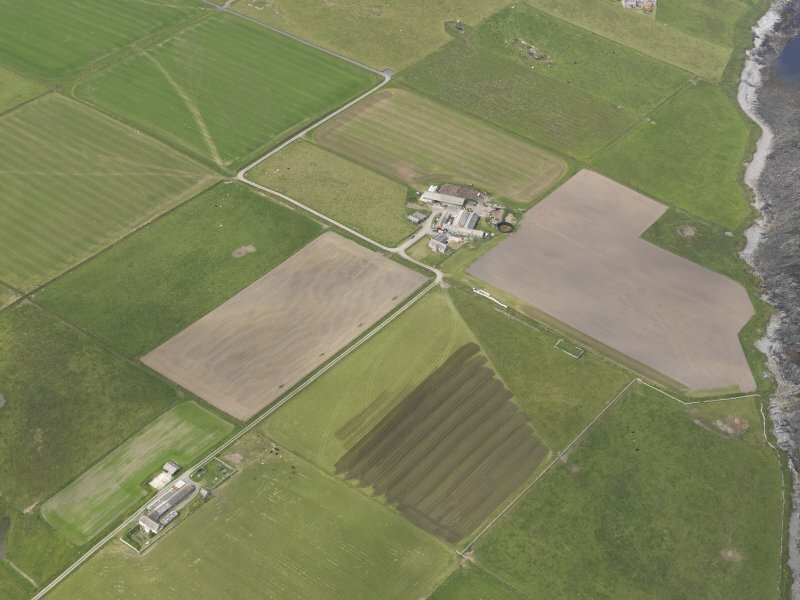 These extra defences may have been constructed because of the broch's low-lying position in the landscape. OS 6"map, Orkney, 2nd ed.,(1900). A broch, the base of which is fairly complete, stands close to the sea, some 32 yds from the low rocky beach. 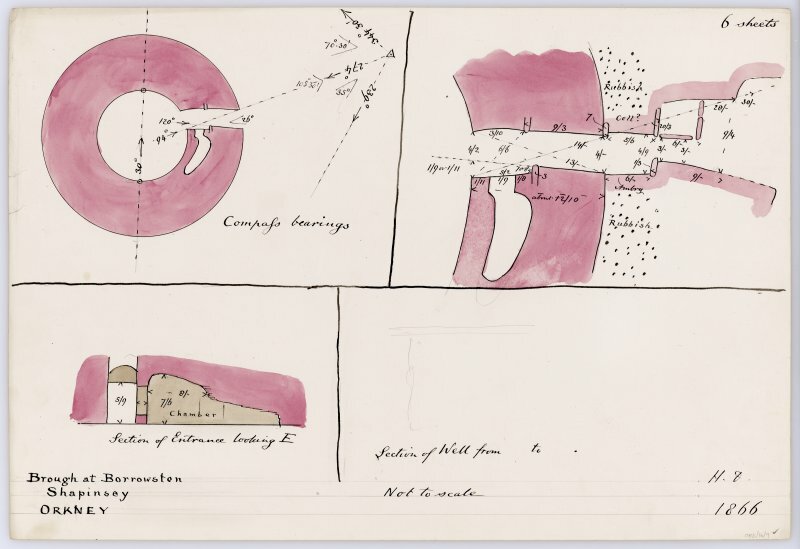 The site was excavated by Petrie and planned by Dryden about 1862 and the plan (RCAHMS 1946), incorporates some features taken from Dryden's plan which are no longer to be seen. Except on the E towards the sea, the broch is surrounded by a rampart rising 6'- 7' above the bottom of a ditch nearly 20' wide. The ditch is bounded on its outer edge by a parapet, parts of which still stand from 2'6" to 3' high and Dryden found traces of a stone wall on the inner side of the rampart some 9' from the broch wall. The broch has an average diameter of 33'6" within a wall 10' - 14' thick. The inner wall-face, showing a scarcement, stands approximately 12' high but the outer face was not laid bare in the 1862 excavations. The roofless entrance passage in the E has door-checks, bar-hole and guard chamber and the interior contains a 10' deep well and a later work now hidden by debris, but traces of radiating walls and compartments can still be seen. 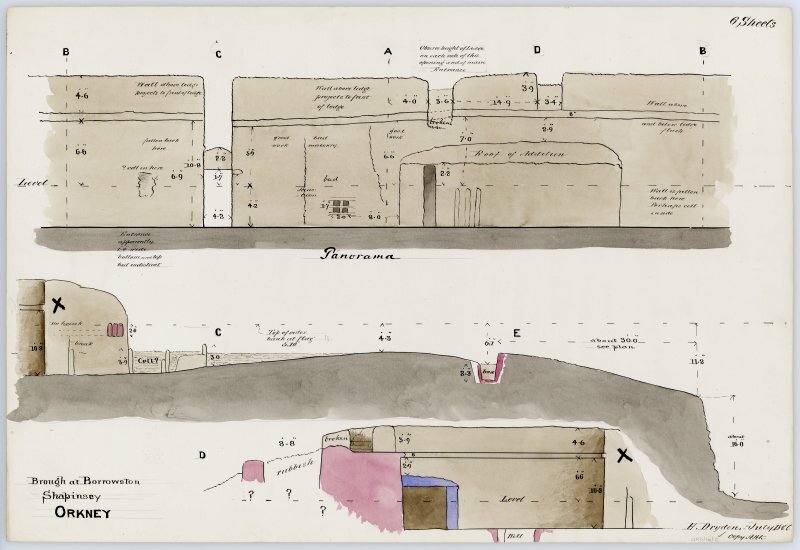 In the sloping area in front of the entrance the 1862 excavations revealed traces of "out-buildings" connected to the broch by an extension of the entrance seawards. These structures have now become covered with turf. RCAHMS 1946; G Petrie 1873. 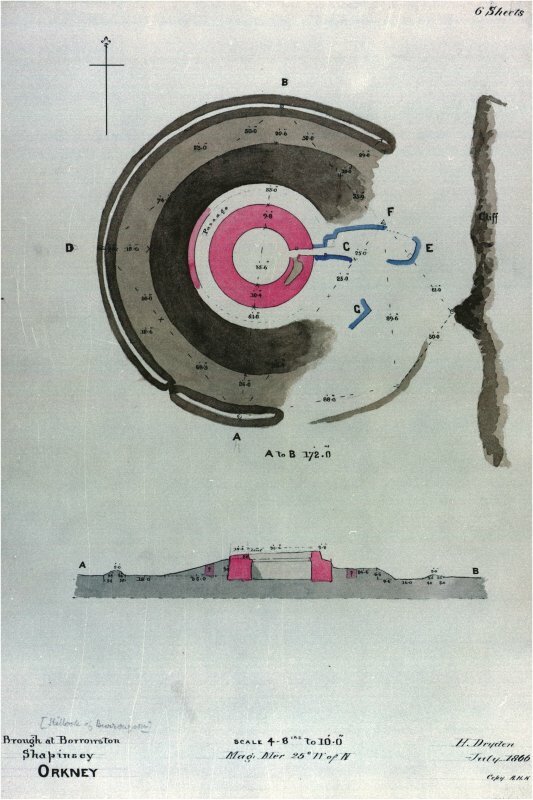 A broch with outworks generally as described by the RCAHMS. The outer face has been exposed in two or three places giving a wall thickness of 3.7m except in the N where it is only 3.0m but here the coarser masonry suggests a later reconstruction. 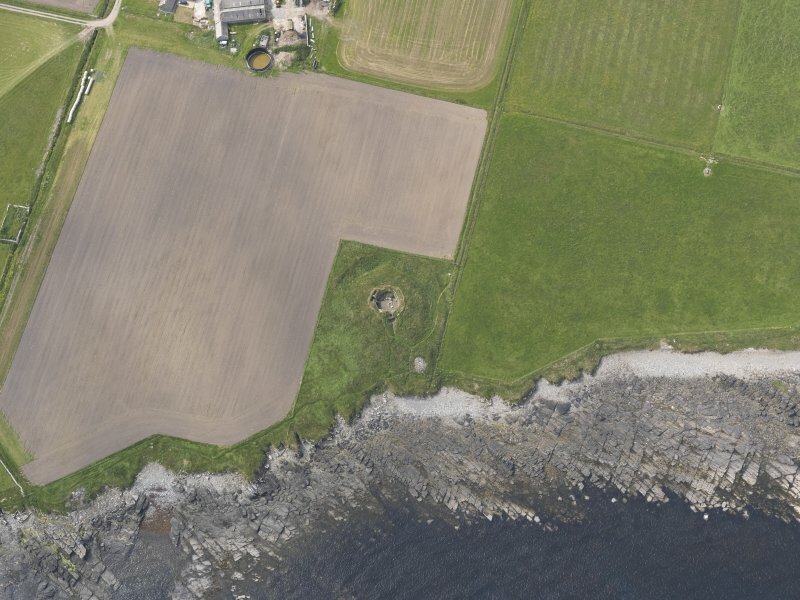 The outworks probably once completely encircled the broch, but have been destroyed in the E by the later buildings. The name, though still known, is no longer commonly applied to the broch. About 150m ENE from Easthouse, on the NE shore of Shapinsay, stands one of the most visually interesting brochs of Orkney. It was excavated c.1862 by Colonel D Balfour's estate-workers under the direction of George Petrie, and was subsequently meticulously recorded by Sir Henry Dryden. 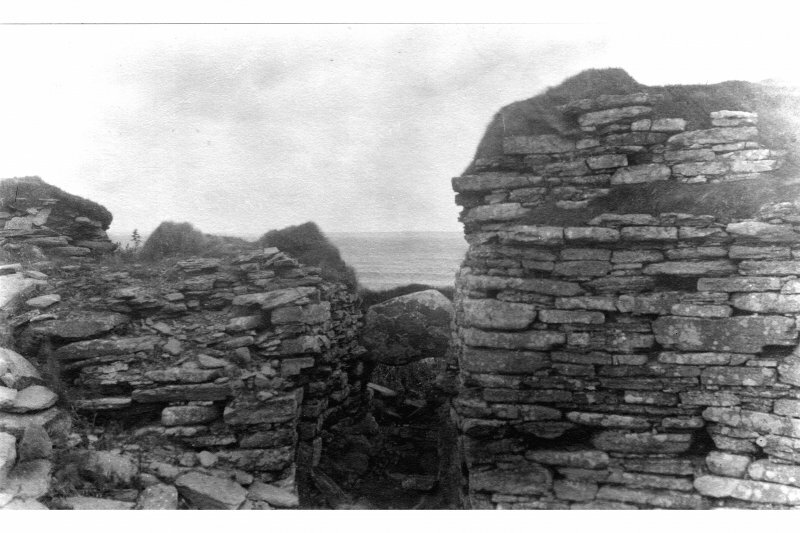 Excavation was confined to the interior of the broch and to a small area immediately outside the entrance; the interior is now choked with rubble which obscures the architectural features below the level of the scarcement. The entrance-passage is well preserved, and there is an impressive cell within a length of walling that still stands to a height of 3.5m above the rubble. Grazing has recently ceased on the site, which has thus become overgrown; the wet outer ditch and bank are still clearly visible. Excavated c.1862 by Colonel D Balfour's estate-workers under the direction of George Petrie, and was subsequently meticulously recorded by Sir Henry Dryden. 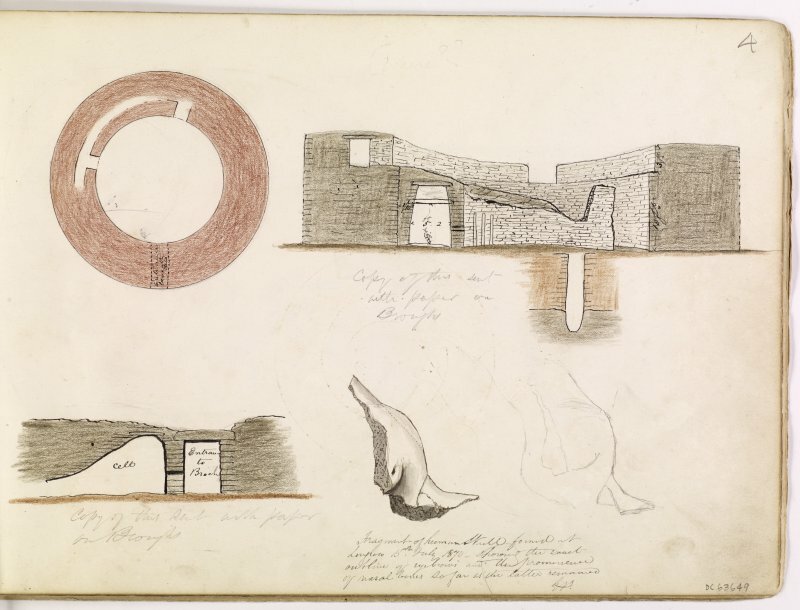 Drawings by George Petrie of sites in Orkney and Shetland in sketchbook MS 28/487/7 in the Society of Antiquaries of Scotland Collection. Broch tower with outbuildings within an impressive outer ditch and embankment. 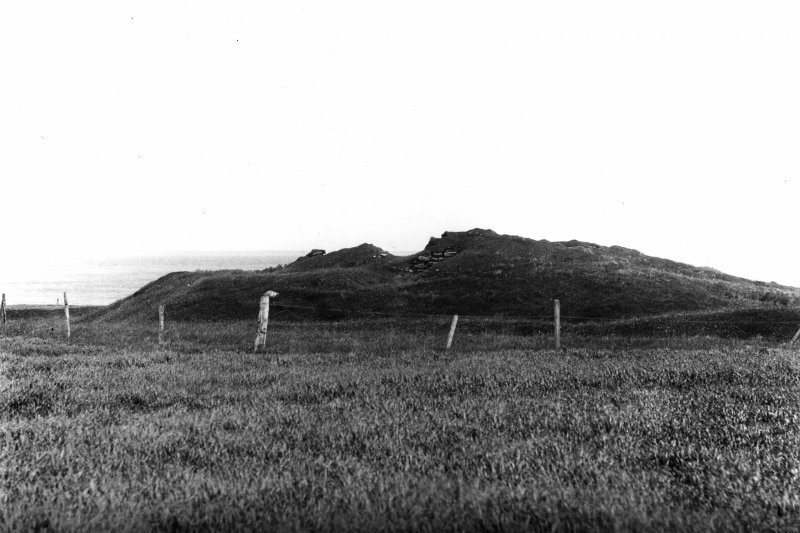 Central broch feature and a small portion of the outbuildings on the sea side where the entrance is, excavated by George Petrie with a team of Col. David Balfour's workmen c.1862. Plans were made by Dryden. The short published account is largely incorporated within the RCAMS description. 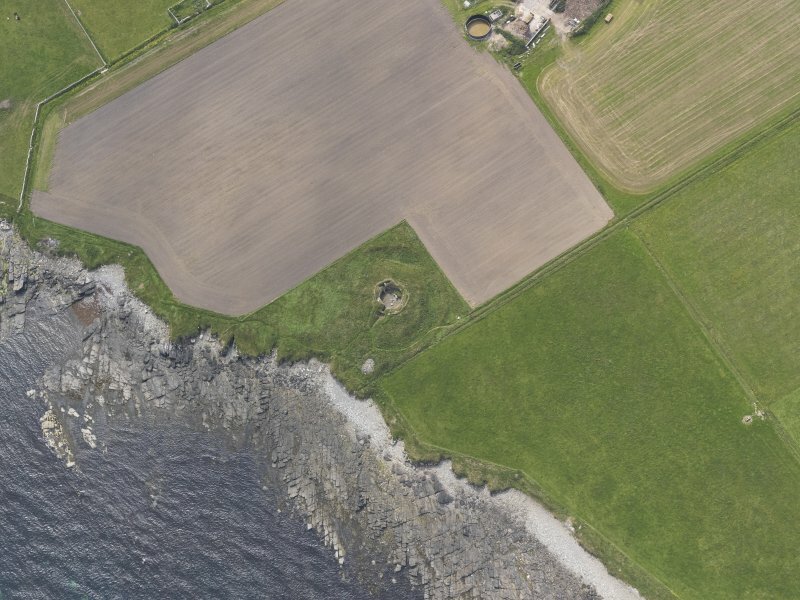 Close to the shore with its entrance facing out to sea, this fine broch survives in part to above first floor level and has been restored (see p.00). The entrance passage has checks and a bar-hole for a door, and a guard-cell on the left on entering. There are the remains of radial compartments inside the broch, along with a 3m-deep well, and projecting from the wall is the ledge which helped to support the first floor. The interior was cleared out in the 1860s with little record. Surrounding the broch is a strong defence of concentric wall, ditch and rampart, which, from an old plan, appears originally to have encircled the site entirely, perhaps making up for the lack of natural defence on this low coast. The ground outside the broch is very uneven, and there have clearly been other buildings in the space between the broch and its defences. Information from ‘Exploring Scotland’s Heritage: Orkney’, (1996). 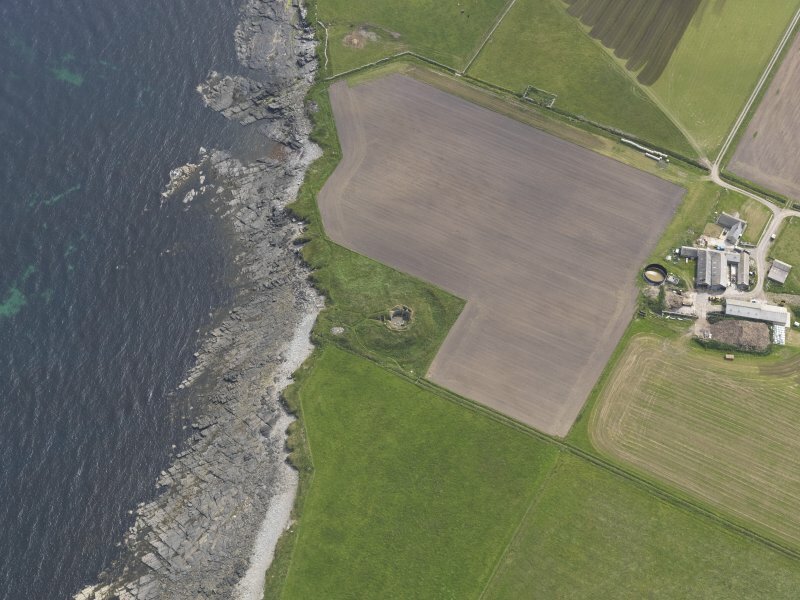 A solid-based broch on Shapinsay standing at the foot of a gently sloping field just above the low rocky beach. The grass-grown structure may be on a platform, and is surrounded by a huge ditch. 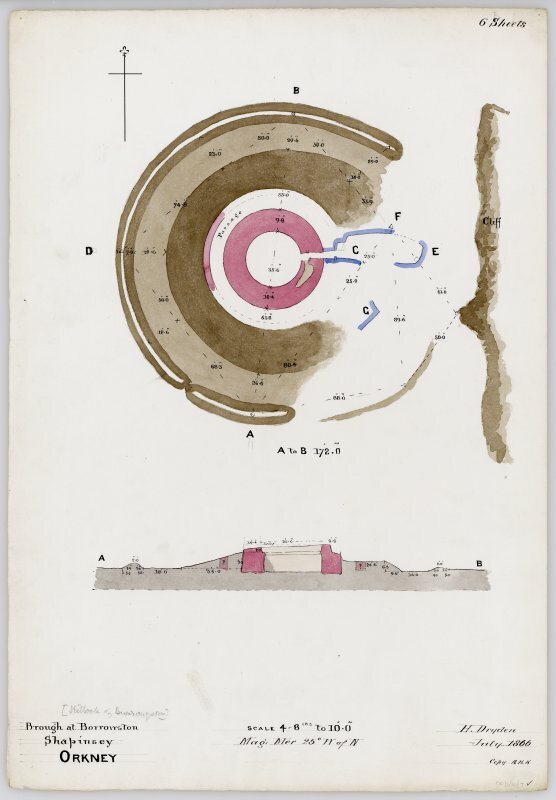 In about 1862 a Mr. Balfour of Balfour and Trenabie got some men to open up the mound “shortly after the discovery of Maes Howe” and George Petrie made notes on the structures exposed while Sir H. Dryden made a plan of them. 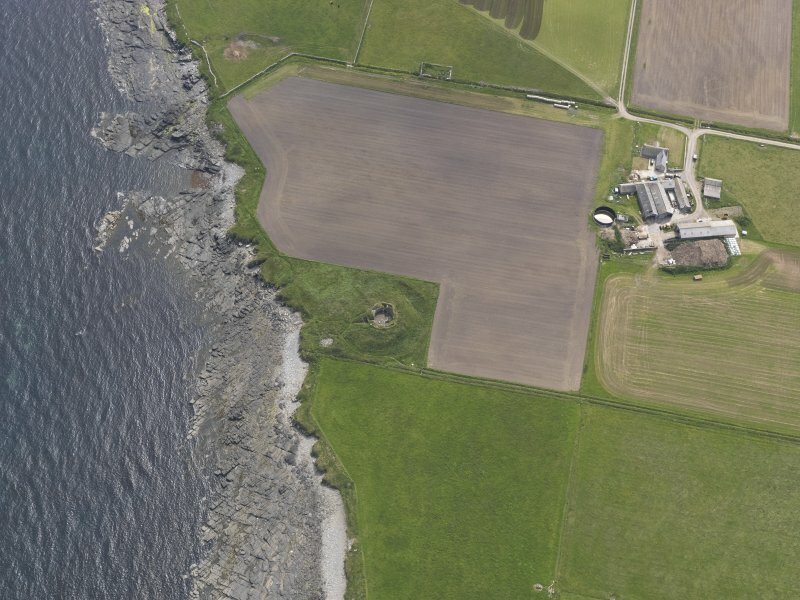 Very little can now be seen of broch in general from the outside since little of the outer wall was exposed during the excavations; the building appears now as a grassy mound. The entrance passage is still visible with a little of the outer wall face on either side of it; it faces east and is about 3.7 - 4.0 m (12-13 ft.) long, 1.2 m (4 ft.) wide and 1.8 m (6 ft.) high. It now has one massive lintel at the outer end (the others having been snapped off), and in 1862 this was described as three close-set together on edge; they must have supported the outer wall face. The doorway below the lintel is now blocked u The underside of the surviving lintel presumably gives the height of the remainder, and it can thus be seen that the south side of the passage extends for at least 1.5 m above this level; it must therefore be the side of the chamber above the entrance. Two door-frames are still apparent, some 2.5 m (8 ft. 1 in.) and 2.2 m (7 ft. 2 in.) 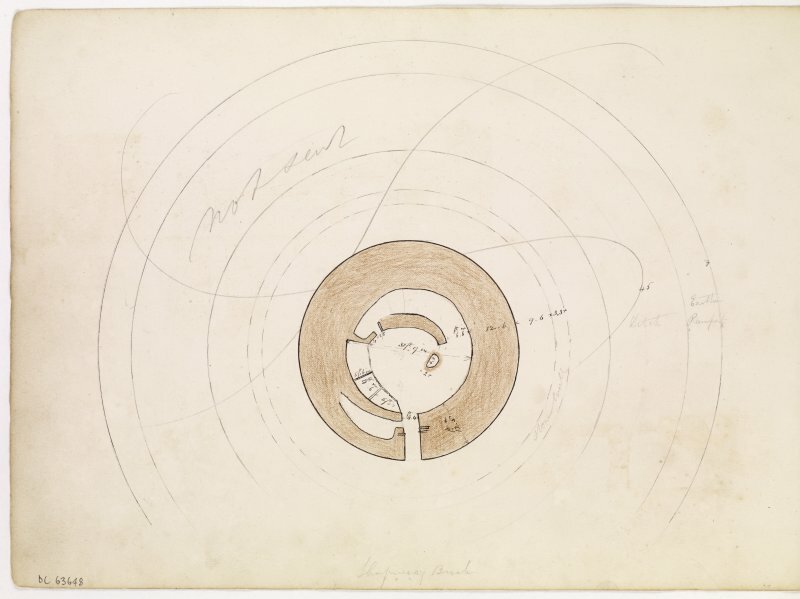 from the outer end of the passage according to Dryden's plan; thus they are not quite opposite one another. The one on the left (looking in) is made from a projecting slab, and the other is a built check. Behind the left (S) check is the bar-socket and the hole can be seen opposite it. There is an elongated guard chamber opening from the left side of the passage (looking in), the door being only 41 cm (1 ft. 8 in.) wide. This cell is 4.4 m (14.5 ft.) long and about 2.4 m (8 ft.) high at its outer end; it diminishes gradually in height (to 1.14 m or 3 ft. 9 in.) and in width towards its inner end. The chamber is roofed with flat lintels which probably means that there is an upper gallery immediately above it. There is an ingenious slot leading from this chamber to the entrance passage in front of the door-checks; a ranging pole can be poked through this, so presumably a spear could in Iron Age times. 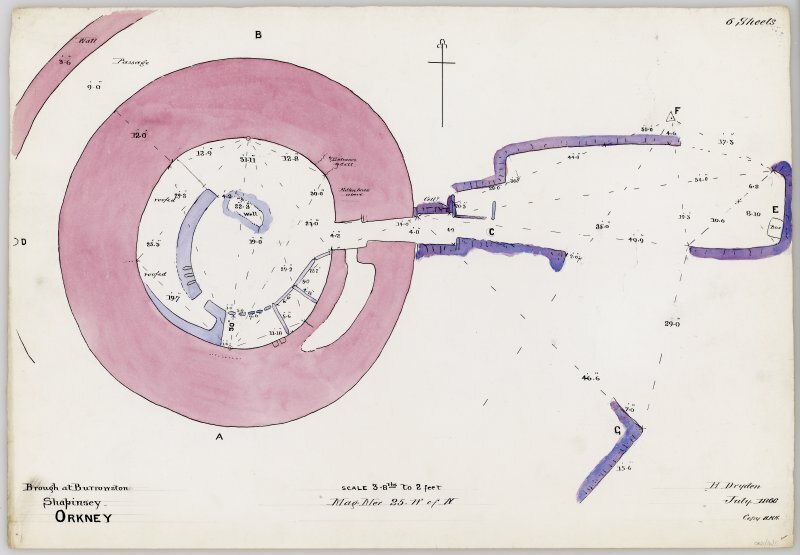 According to Petrie the average internal diameter of the broch is 10.2 m (33.5 ft.) and the wall apparently varies in thickness from 4.3 m (14 ft.) down to 3.05 m (10 ft.) or less . Petrie actually describes it as thick at the entrance and on the opposite side, being thinner elsewhere, so he may have been mislead by a thinner wall head thickness in places. The wall was later measured as 3.7 - 4.0 m thick (12-13 ft.) near the entrance . The inner face stood to a maximum height of 3.7 m (12 ft.) on the east and west in 1928  but Petrie recorded it as 4.0 - 4.3 m (13-14 ft.) [2, 81]. On this face is a scarcement ledge 2.7 m (9 ft.) which was above the floor in 1928  and 3.1 - 3.4 m (10-11 ft.) in Petrie’s day : it is not much more than 2.5 m above the interior ground level now. The scarcement is of the “shelf” type and Petrie records it as 45 cm (18 in.) wide. Petrie records two openings 1.1 cm (3.5 ft.) wide in the inner wall face nearly level with the scarcement, one at 12 o'clock and the other at 9 o'clock [2, 82]. Dryden's drawing shows one of these raised voids with its sill at scarcement level [2, fig. 12: 3, fig. 363], and he also shows a section through the raised mural gallery (which looks rather low) on the same level, resting on a wallbase which seems to be solid up to that point. 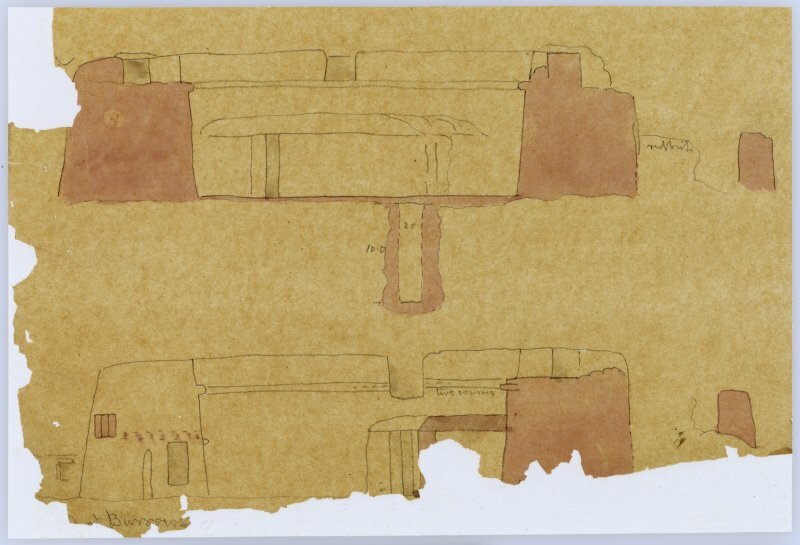 However he also shows a section of what looks like a very low gallery at ground level, also at 9 o'clock, but nothing is indicated here on the plan; it is in fact the misplaced cross-section of the inner end of the guard chamber, which ends at about 7.30 o'clock. The upper gallery is recorded as 84 cm (2 ft. 8-9 in.) wide. There were also traces of “two ascending steps” in the gallery at one point, and “three at another” [2, 82]. No proper mural stair is described, and no door to it from ground level is shown. It may well not have been discovered behind the secondary constructions (below). At present the outer face of the upper gallery is clearly visible from about 9.30 - 11 o'clock, with one lintel still in position. Traces of the opening to the upper gallery from the interior are still apparent at 9 o'clock, but the one at 12 o'clock is hidden or destroyed. The inner face of the upper gallery runs anti-clockwise towards the entrance from the first void. Secondary constructions with radial partitions were found in the broch interior. 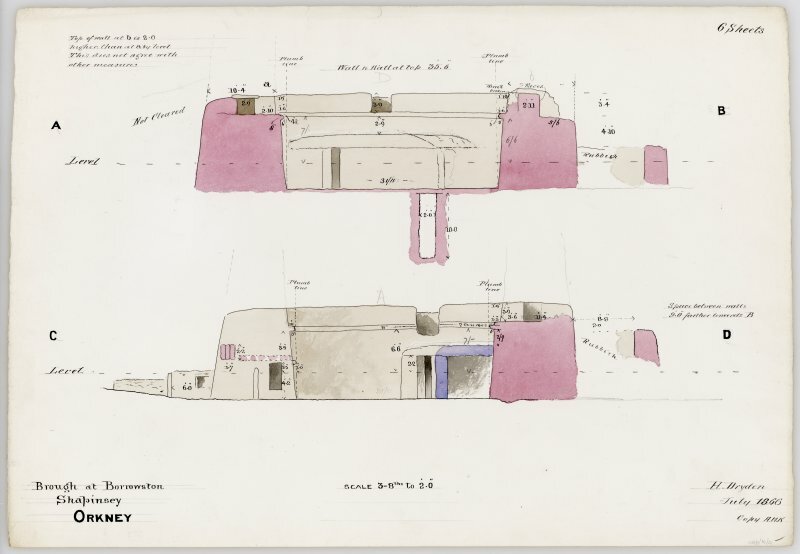 Though Dryden's plan and elevation are not altogether clear, the section seems to show some form of incomplete aisled wheelhouse-like structure with radial piers joined by lintels to a secondary wall constructed against the inner face of the broch wall on the arc from 6-9 o'clock. At one point a solid block of masonry appears to project and lie against one of the radial stone slabs; on its other side it is shaped like an alcove, rather similar to the structure at Midhowe (HY/33 1); this was roofed with lintels when found, and the elevation shows this [2, fig. 12]. A deep well was in the broch floor, appearing like a vertical shaft in Dryden's section: the upper part was of dry stone masonry, the lower cut into the rock. An extension outwards to the main entrance -- evidently with door-checks of its own -- was built at one point for about 3.66 m (12 ft.) and led to an “oblong building” . An outer wall was found to be concentric with the broch on the W, and about 2.74 m (9 ft.) from it. Beyond this was a broad ditch from 4.9 - 5.5 m (16-18 ft.) wide at the base with an earth bank or parapet beyond this, 76 - 92 cm (2.5 - 3 ft.) high in places.. Only on the seaward side are defences lacking, and here traces of outbuildings were found. The inner wall stood 1.8 or 2.1 m (6 or 7 ft.) above the bottom of the ditch outside it. Dimensions. The external diameter has to be estimated as the wall thickness of 3.7 - 4.0 m (12-13 ft.) is apparent now only at the entrance. Taking the internal diameter as 10.21 m (33.5 ft.), the external diameter should be about 17.7 - 18.0 m (58-59 ft.) and the wall proportion 42.5%. 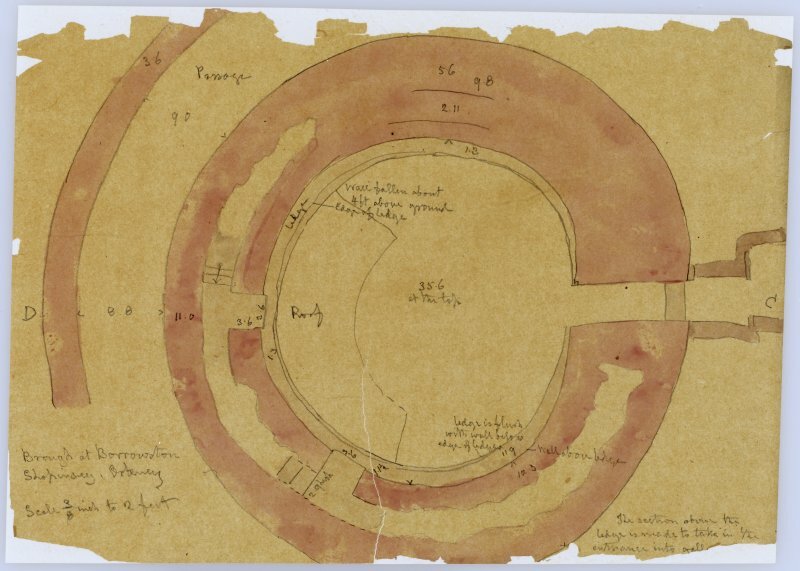 New measurements of the interior wallface in 1985 by the writer showed that the broch was probably intended to be built round a true circle with a radius of 4.82 +/- 0.12 m, equivalent to a diameter of 9.64 m (31.61 ft.). Finds. Little information was available about these but a list is now available . According to Petrie they were mostly deer-horn fragments, many ox and sheep bones and "several rude stone vessels of different sizes", including a possible triangular lamp Only a bone or antler 'perforated mount' now survives [4, 122]. A stone lamp from 'Shapinsay' in the Hunterian Museum could be from this broch (B.1914.829). Sources: 1. OS card HY 52 SW 4: 2. Petrie 1890, 81-4 and 87: 3. RCAHMS 1946, 3, 275-76, no. 778 and figs. 362 and 363: 4. Hedges et al. 1987, 122-24 and pls. 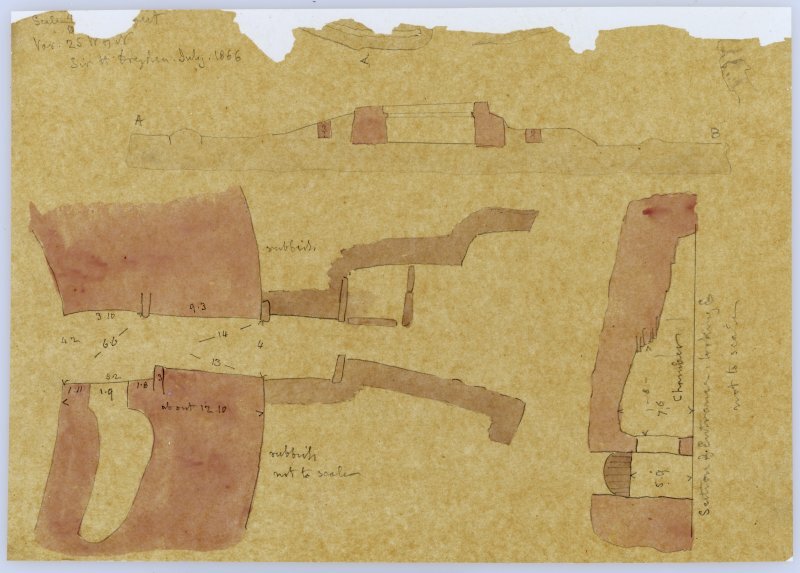 3.16-3.20 (ms plans (two), panoramas (two) of interior, and general plan of broch and outer wall, by Dryden): 5. Lamb 1987, 11.
noticeboards in the interior of the broch and for the removal of stone from around the site for its construction. Nothing of archaeological interest was noted. Archive deposited with Orkney SMR.